It’s said the kitchen is the hub of the home, but that doesn’t mean you have to sacrifice the charms of dining out when you eat in! With a few small tweaks and additions, you can enhance your home and create a fabulous 5* dining experience from soufflé to scrambled eggs. Here are a selection of interior design tricks to simulate the restaurant experience and bring a little style and sophistication to your kitchen. Restaurants create seductive atmospheres by having bold, confident designs. Think bright, sweeping surfaces in a modern eatery or exposed brick walls in a rustic bistro. 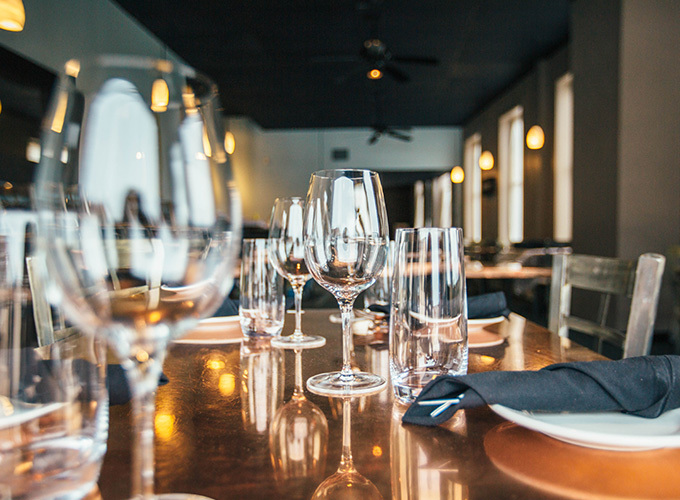 There are endless options when it comes to creating a restaurant vibe in your home and choices will largely depend on your personal tastes and preferences. For a traditional vibe consider kitchen design ideas with dark floors or dark cabinets. Don’t be fearful of dark colours but make sure that you incorporate plenty of light into the room – otherwise, the space can appear smaller than it is in reality. Incorporating prints, patterns and daring colours can create a real sense of verve and style regularly seen in the best restaurants. Conceiving the perfect kitchen can be difficult, especially when it comes to kitting out your new foodie hub with appliances and accessories. 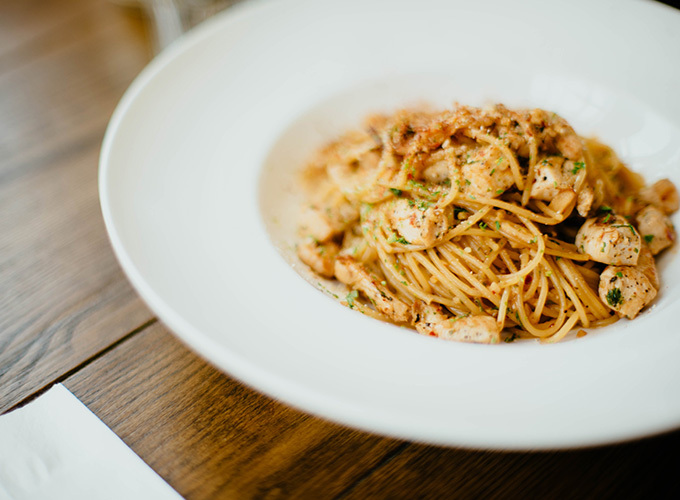 While you might perceive the way to make your home feel like a restaurant is to intricately match every last plate, pan and placemat there is a cohesion to be found in mixing and matching. Particularly pertinent if you want your kitchen to feel like a rustic European bistro with wooden shutters and vintage charm, having an eclectic mix of crockery, utensils and, when done carefully, even furniture adds to the captivatingly kitsch vibe. Shutters possess a certain finesse. Perennially stylish, shutters are adaptable to a range of styles, from contemporary designs to vintage looks. On a summer’s morning, open the shutters and flood the room with natural light as you tuck into decadent eggs benedict. During the dark, winter months you can close off your kitchen to the outside world, light some candles and chink glasses over a rich pot of bouillabaisse as you create your own little French bistro without leaving the house. 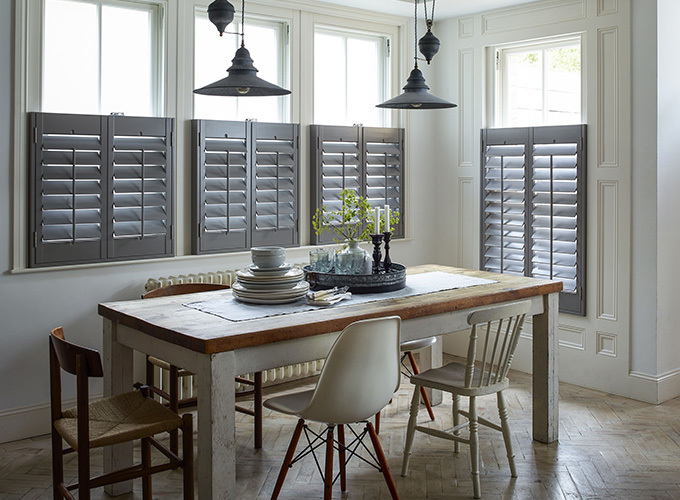 Café style shutters are a great choice for kitchens and dining rooms, instantly giving a relaxed and rustic look. Solid panel shutters are great for creating a colourful room separation between kitchen and diner, especially if you’re hosting a dinner party. And you can also choose custom shutter colours to match the décor of your room. Keen to go for bold tones but unsure how to do it? Dark shutters on a pale wall add a stunningly dramatic effect. Good lighting knows no bounds. It has the ability to set the tone of a room and make your kitchen feel just like your favourite restaurant. Dark corners can be illuminated with lamps and track lighting can be beneficial for rooms with multiple spots which struggle to get any natural light, while LED spotlights help to ensure the light in a room is even. One of the easiest and most effective ways to generate a restaurant-like feel is to invest in low-hanging lights. These should be positioned over key features such as tables, kitchen islands and focal points such as an Aga. If you’d prefer something a little more seductive, mini-pendants are less bright and will set the mood for a romantic meal at home. You should also consider the natural light in your room and work with it. The key with restaurant lighting is to give yourself the option of bright light when you’re cooking, with the ability to dim it down for when you sit down to eat. Large houseplants can be an excellent focal point for any kitchen. Restaurants often use large flora to fill space and make the room feel more intimate. As well as their aesthetic value, plants also reduce the amount of carbon dioxide in your home and reduce the amount of dust in the air to create a healthy, clean environment for dining. English Ivy is the ideal plant for creating a restaurant vibe in your home. It works exceptionally well in a basket hung above the table, bringing an air of nature to proceedings while also filling the space for a cosy feel. 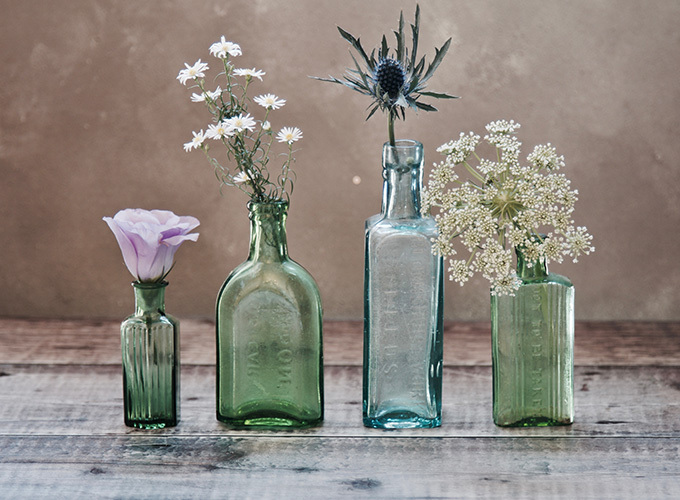 Having a little vase or jar with fresh flowers on the table is a great choice as well. 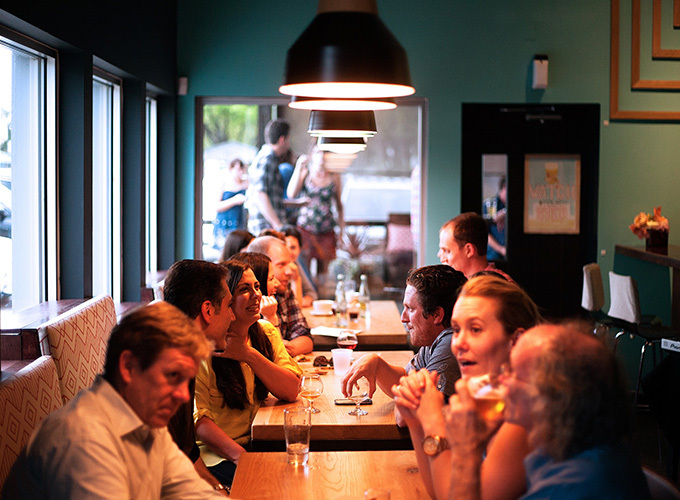 Restaurants are designed to be hospitable – a place of sheer enjoyment, not a place of practicality. While your kitchen at home often serves as the heart and hub of the home, turning everyday necessities into a focal feature has the potential to revolutionise the space. If you’re looking for luxury kitchen ideas, invest in elements like a hidden dishwasher drawer or a built in recycling unit. Keeping your white goods and rubbish out of sight helps you feel like your kitchen is a place for relaxation not work. 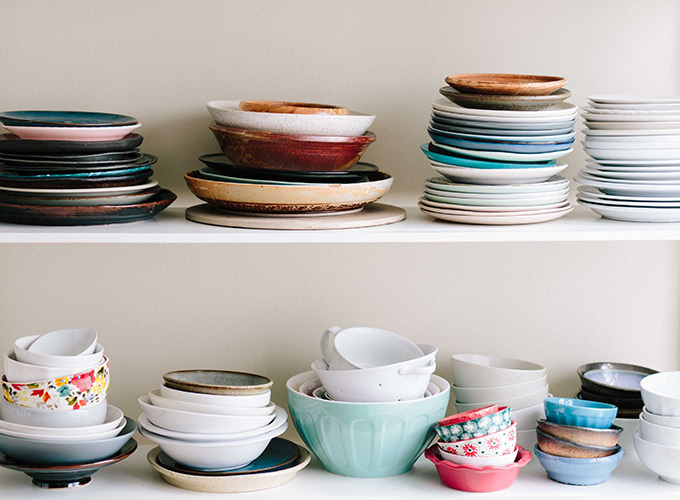 You can also keep the kitchen clutter, and thus stress, free with handy and aesthetically pleasing features such as pot and utensil racks, deep drawers and corner storage units. Our guide on design for small kitchens has more tips here! 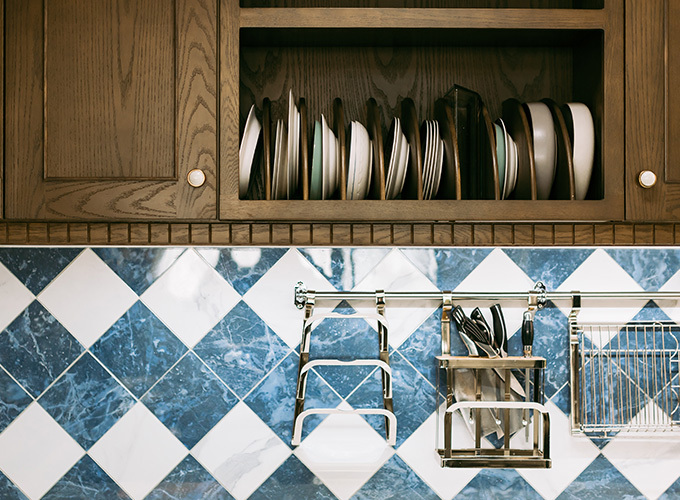 When extensive planning and execution has gone into designing and fashioning your dream kitchen, cutlery and crockery (which after all are the nuts and bolts of any kitchen) are often overlooked. Even if you aren’t in the market for a large-scale kitchen redesign, an injection of metallic accessories or ceramic crockery can transform Friday’s slap-up tea to a relaxed end to the working week. Tables and chairs are at the centre of any visit to a restaurant and investing in a new wooden table or perhaps some squat chairs can lift the room. Alternatively, opt for a new set of plates and bowls – pastel ceramics give a Scandi vibe, while oversized plates and bowls give a smart look to any dish. And lastly, whether you’re drinking wine, beer, or soft drinks, smart glasses are a joy to drink from, and give an instant luxe vibe to your table décor. 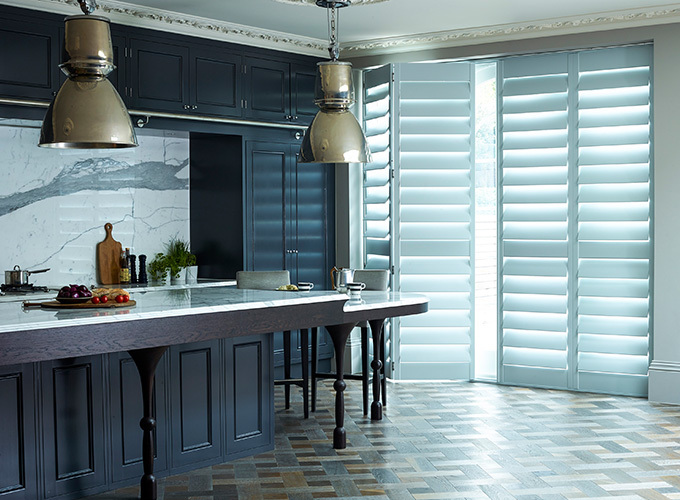 At Shutterly Fabulous, our team of expert consultants are specialist in selecting shutters to work in any type of kitchen. Contact us today to discuss your windows and get a tailored quote.